Cravings are strong yearnings for specific foods, usually those with high sugar or high fat content. Unlike the normal hunger that we experience between meals on a daily basis, cravings are triggered by emotions, situations, or pleasant associations. They are linked to our mind's reward system and often these associations stem back to childhood, holidays, enticing smells, or social situations. Indulging a craving can trigger a diet-destroying binge. When you eat a food you long for, your brain releases dopamine (a natural chemical linked to pleasure) making this mind-body connection an inevitable reality to deal with. In fact, many of us soothe feelings of stress, depression or boredom through "emotional eating" which provides a fleeting sense of comfort associated with specific foods. Understanding the power of cravings and controlling them is crucial to keeping your Arc-toned body toned. Caving in to a craving once in awhile isn't such a big deal - the problem is that if you do it one time, you're much more likely to swing by again. Much processed junk food has chemicals and hormones that make it addictive and those who frequently eat fast food and products with high fructose corn syrup are more likely to pack on the pounds. You will overspend and buy nutrient-poor products your body neither wants nor needs. No matter how strong your willpower is, shopping while hungry will just set you up for self-sabotage, so make sure to have a healthy, small snack before you shop. Be smart and implement a food shopping strategy. Make a list and stick to it. Designate one day a week as your shopping and food preparation day. By developing this ritual, you become more organized and disciplined. Your mom was right when she said that breakfast was the most important meal of the day. Always make sure to eat within the first hour after rising in order to jumpstart your metabolism and burn more calories throughout the day. People think that they are saving calories when they skip breakfast but it's really quite the opposite. Make sure to have you have a balance of protein and complex carbohydrates to sustain you through a bracing Arc Trainer workout and morning tasks. Why sabotage yourself? It is the common law of nature - once something is in your sight, you want it! How many times have you triggered your own food craving by keeping that candy bar in your desk drawer or that batch of cookies in your kitchen? It's only natural to want a bite when you see it. As the saying goes - out of sight, out of mind! Keep fruits, vegetables, and other healthy staples in your surroundings. By eating 4-5 small meals per day you will keep your metabolism & blood sugar levels in check and keep your cravings at ease. Any kind of exercise will helps you release endorphins, improve your mood and help you combat your cravings, especially if you can schedule your workout at the specific times that your cravings occur. Logging in some time on the treadmill or Arc while listening to music or watching TV will distract you from fixating on the food you crave. Media and marketing has programmed people to turn to food as their outlet whenever they become stressed. By discovering alternative ways to relieve your stress, you will soon be able to channel your stressors into something positive. Try taking a brisk ten minute walk the next time that your nerves get rattled. You may also want to try incorporating yoga or meditation into your routine at least once a week. I hope these tips help you next time you confront an inevitable food craving. 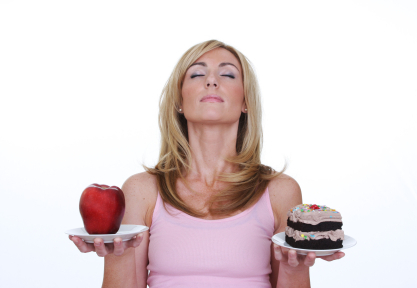 Here are some more tips on managing food cravings. These cravings will inevitably occur, but you do not have to obey them. Keep that hard-earned Cybex body intact with good nutrition and sound eating habits!